A multidistrict litigation (MDL) has been created for lawsuits alleging permanent hair loss resulting from use of the chemotherapy drug Taxotere. On October 4, 2016, the United States Judicial Panel on Multidistrict Litigation (JPML) granted a motion to transfer and consolidate these cases after considering input from counsel for Plaintiffs and Defendants. Zoll & Kranz, LLC was one of the firms involved in this process, having filed a response supporting the consolidation of the cases and creation of the MDL. The newly-formed MDL is titled MDL No. 2740 IN RE: Taxotere (Docetaxel) Products Liability Litigation. The JPML also chose to consolidate the cases in the Eastern District of Louisiana before the Honorable Judge Kurt D. Engelhardt. 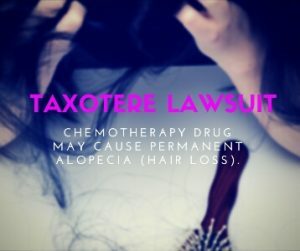 This means that the cases filed in federal court alleging that Taxotere caused permanent hair loss and that the manufacturer Sanofi-Aventis did not warn of the risk will be transferred before Hon. Judge Engelhardt. MDLs are commonly confused with class actions. Although they are both litigations in which multiple people allege similar injuries caused by the same problem, there are significant differences. Importantly, because cases in an MDL do not share the same very high degree of similarity required for a class action, MDLs are structured to handle common issues while preserving the individual nature of the lawsuits. You can learn more about multidistrict litigation here or by contacting our experienced and knowledgeable MDL and mass tort lawyers toll free at (888) 841-9623. Zoll & Kranz is continuing to investigate a potential connection between the chemotherapy drug Taxotere and permanent hair loss. If you believe you or a loved one may have been affected by the use of Taxotere, we offer a free case evaluation. You can reach our caring and experienced Taxotere lawsuit team through our form on the webpage linked here or call toll-free at 888-841-9623.